As most remember, a major freeze took over the DFW metroplex back in 2011 and the whole city was almost in shambles! Us Texas folks don’t like that snow and ice! January is now upon us and this is one of the most inopportune times for weather such as this. However, this cold and freezing season is fast approaching. With that in mind, know that Knight is there. In the past year, Knight has invested hundreds of thousands of dollars in desiccant and heated drying systems designed to handle and target over 500,000 square feet in a specific facility. Each unit is powered by Knight’s trailer mounted generators that provide anywhere between 100-250 KW of power to each unit. 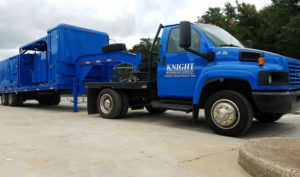 These desiccant systems are brought to the site by Knight’s towing vehicles and are placed strategically around the facility for best access points. Once placed, a tubing system is laid out and plastic ducting is hung from the ceiling throughout the facility to provide very warm and very dry air to keep the climate warm and comfortable. Also, these desiccants provide an astronomical amount of assistance during the drying process as they cover over 15,000 cubic feet per minute of air. That’s a lot! 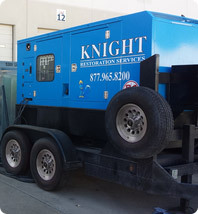 So, when the cold spells hit and facility goes down, know that Knight has the “POWER” to get the facility and climate back into a working and comfortable environment within hours of the initial call. Don’t hesitate, give us a call! Learn more about being prepared!